Tracks are the most commonly used element in OTIS; they are searched for in catalogs, added to playlists, add to albums, and submitted to opportunities. Fundamentally, a track consists of basic information (like a name, artist, or catalog number) and a sound file, as well as whichever metadata a user chooses to add. This can include information like writer or publisher credits, genre and style information, keywords, instrumentation, etc. 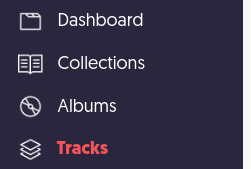 While there are a variety of places on the site you can add tracks, usually you will start working with them on the Tracks tab.